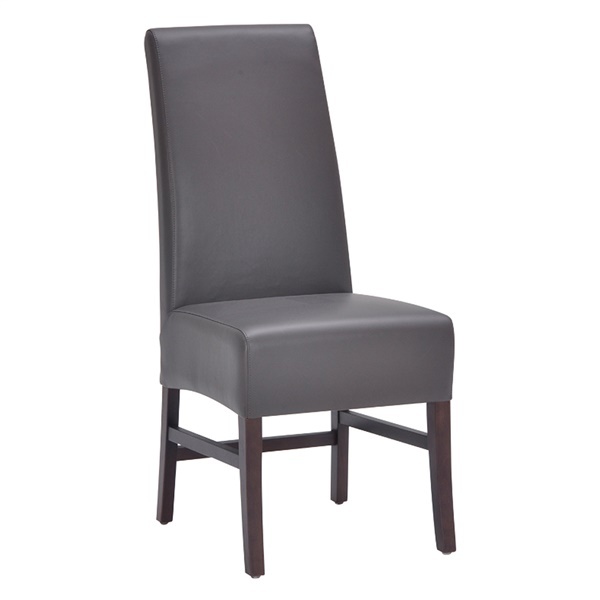 Dine in comfort and high style with the Sunpan Habitat Dining Chair. This modern take on a classic parson chair is as beautiful and sleek as it is functional and sturdy. Its minimalist, understated design makes it a good fit for many table styles and any number of decors. A solid wood frame with built-in supportive stretchers ensures that the Habitat will beautifully stand up to everyday wear. A high back offers optimum support, while extra-thick back and seat padding ensures comfortable use. The chair is upholstered in sleek and soft bonded leather for a luxurious look and feel. Its slender legs feature an espresso finish for a touch of depth and richness. The chair is available in several different colors for a looked that�s tailored to your preferences. This chair is perfect for dining, but works equally well as an occasional or accent chair.